Grand kids Asher and Kate were back in Georgia but G-mom and I had another week’s visit in Virginia. Out son was being promoted to Lieutenant Colonel and there was no way we would have missed the pinning ceremony. Along with the summer fun of swimming, playing board games, eating ice cream, and all of the other summer activities there does come a time for chores. The flowerbed in the front yard needed weeding so the boys and I donned gloves and with the sun hidden behind afternoon clouds, we whistled off to work. The boys soon found that gathering squash and tomatoes for mom was much more fun than pulling weeds. And, they were excited about putting food on the table. So I pulled weeds. 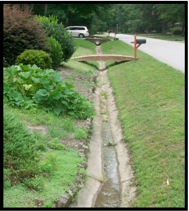 The house sits on a corner lot with large drainage ditches instead of curbs that direct rainwater into a corner culvert. This photo shows one of the ditches and the bridge from the street to the front porch of the house. We were supposed to be weeding in the flowerbed on the left side of the photo. Dirt had accumulated in one of the ditches and a few weeds had taken root. The boys began pulling these weeds but soon found it much more interesting to dig in the dirt. It quickly became a contest as to who could build the tallest dirt mound that once that was settled transitioned into filling cardboard boxes with dirt. The boys decided they would like to mix mud in the cardboard boxes to make the mounds stronger so they uncoiled the garden hose and drug it to the ditch. I warned the boys that adding water to the dirt in the boxes would quickly weaken the cardboard but, as grand kids often are, they were skeptical. One of the joys of being a grand parent is letting the grand kids, as long as the activity is safe, find out for themselves how things work in the real world. I try to curb my need to explain everything and to just let the kids find out on their own the consequences of their actions. 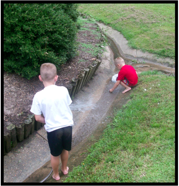 The boys added water to each box of dirt and for the first minute the seams held but then each box burst open and the boys were excited as to how the mud oozed out, into the ditch, to be swept away by the running water from the hose. In this photo John and Andrew are shown at the intersection of the two ditches. John is hosing the last of the dirt down the ditch as Andrew starts to build a dam. Damming a stream of running water comes as natural to boys as going barefoot. What I’ve just written describes just the first hour of a memorable summer afternoon. In the next post, I will share what the boys and I did during the second and third hours. Hey Jim, Thanks for sharing your informal scientific journeys as a granddad. I posted an article from Tech Review on your facebook that I am interested in your response to.